The difficult process of negotiating the EU’s next seven-year budget covering the years 2021-27 is already under way. However, as Dimitar Lilkov writes, the negotiations may well prove more contentious than ever due to a proposal to allow the European Commission to suspend EU funding for states that threaten the rule of law. The current draft for over 1.1 trillion euros (between 2021 and 2027) came bundled with an additional eye-catching proposal for a new institutional mechanism. The Commission proposes that it should be granted the ability to cut European funding in order to protect the Union’s financial interests from the risk of financial loss caused by systemic deficiencies as regards the rule of law in a given member state. At the moment, the Commission can make financial corrections for administrative mismanagement of EU funding, but it cannot penalise a member state directly for systemic irregularities of its public prosecution services or the compromised independence of its judiciary. The Commission ultimately depends on the justice systems of every country – only national authorities can prosecute fraud involving the EU budget such as corrupt practices in public procurements or grant procedures. Existing EU-wide bodies such as Eurojust, Europol and the EU’s anti-fraud office (OLAF) lack the necessary mandate to carry out criminal investigations and prosecutions. And the money involved is big. A huge part of the EU budget is devoted directly to helping countries in Southern, Eastern and Central Europe ‘catch up’. Take Poland for example. As the biggest beneficiary of European Structural and Investment Funds, the country has been allocated more than 80 billion euros between 2014-2020. This is close to the same amount of money (in today’s prices) as the whole Marshall Plan for Europe after the Second World War. Singling out specific member states is not necessary, it is a truism that European Union funding has become a sacred cow for many countries. Between 2015-2017, the EU’s cohesion policy funding accounted for more than a third of the public investment made in thirteen countries – and in eight of them the figure is close to (or goes beyond) a staggering 50 per cent. On the face of it, the Commission is leading a laudable effort in safeguarding the management of European taxpayers’ money. However, the proposal aims to achieve at least three additional goals. First, the Commission aims to officialise a mechanism which has been informally in place in the past. There have been several instances in different new member states over the last decade when the Commission has suspended or threatened to suspend European funding for systemic corruption or specific cases of embezzlement. The nuclear option of cutting funding has been criticised as an attempt by the European Commission to intervene in domestic policy and apply political pressure to national governments. By adopting a new rule of law mechanism with a transparent procedure in place, the Commission would be able to directly voice its concerns and rely on a reinforced procedural arsenal. Second, the Commission is trying to secure an additional insurance policy against member states which directly breach fundamental European Union values. It is tempting to jump to the conclusion that the Commission is targeting Poland and Hungary specifically with these measures, but they are not the only states deviating from EU norms. The uncomfortable truth is that some of the current members of the European Union would be unable to cover the admission criteria for joining it. Brussels is well-known for providing a stringent set of enlargement criteria for applicant countries. In a similar way, the proposed rule of law provision aims to enhance the EU`s own internal conditionality and discipline countries which are already part of the club. Third, the Commission aims to provide a bargaining chip for the upcoming negotiations over the seven-year budget. The adoption of the new rule of law provision could be part of the compromise to appease countries such as the Netherlands, Denmark, Austria and Sweden (dubbed the frugal four) who are opposed to the planned size of the next budget. Likewise, the Commission might consider dropping the proposal if certain ‘new’ member states accept potential cuts in regional and agricultural funding for the next budgetary framework. 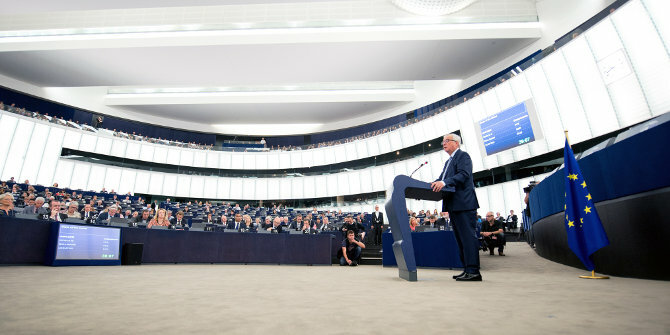 If the Commission’s proposal for a new mechanism is passed, the institution would be able to propose the reduction or suspension of European funding for member states which have registered generalised deficiencies as regards the rule of law. And here comes the tricky part. The adoption of this requires a qualified majority in the Council of the EU, which makes it difficult for certain Central and Eastern European member states to potentially block this draft. However, they could take the whole process hostage by threatening to veto the next seven-year budget (given the unanimous support of all countries is needed) if this proposal is not scrapped. This would further fuel the current East-West divide within the EU at a time when political tensions across the continent are bound to increase due to the upcoming European Parliament elections in May 2019. Establishing new rule of law conditionality for receiving European funds is not only about the money. It is about the European Commission trying to prevent an internal breaking of the ranks and ensure its role as the ultimate guardian of the EU treaties is maintained. The Commission is currently bogged down in two lengthy Article 7 proceedings against Poland and Hungary for the alleged violation of fundamental rights and values which will achieve questionable results given they are expected to be blocked in the Council. The Commission endeavours to avoid future cases in which it finds itself an ill-equipped referee who is unable to maintain the rules which all the EU players vowed to keep before the game started. The upcoming negotiations on the next seven-year budget and the fate of the proposed rule of law mechanism will serve as a litmus test for whether the EU institutions and member states are able to successfully bridge divisions at a time of growing scepticism and external threats to the European project. One might hope we will avoid another disturbing reminder of how far Europe has travelled from the permissive consensus which pushed the EU forward a mere decade ago. Dimitar Lilkov is a Research Officer at the Wilfried Martens Centre for European Studies based in Brussels. These are dangerous times. The municipal elections in Poland on October 21 will probably show that Kaczyński’s Law and Justice party (PiS) retains a stranglehold on power, and next year PiS could well win a two-thirds constitutional majority in the Sejm, with its nationalist ally Kukiz’15. Poland remains an ostensibly enthusiastic EU member only because it still receives massive “catch up” funds. Once, or if, these cash inflows cease, the support for a Polexit, among ordinary citizens as well as PiS, will dramatically increase. Despite noisy gestures by PiS of friendship toward Trump’s USA, extremist right-wingers, such as the Premier’s father, are already making noises supporting a rapprochement with Russia, whose cultural policies and worldview are closer to those of PiS than those of PiS to Western Europe’s. The turn toward Russia by the other V4 countries reinforces this trend. Inflammatory speeches by Juncker and Timmermans, leading to punitive actions, will accelerate a breakup of the EU. Rather, the leaders of the EU need to understand the turn toward authoritarian populism across much of the EU, and take measures which will lead to ordinary people supporting and not rejecting EU membership, leading to an eventual restoration of liberal democracy. Next year’s EP elections are the opportunity for that, if only some sort of pan-European political movements can gain local traction. Varoufakis’ Diem25 is a promising example.